The last time I tried to make a loaf of sourdough bread . I had several issues first of all the dough was so sticky and it stuck to the basket despite the rice flour and wheat flour that I put on the basket! Also I was on the clock and got I impatient! 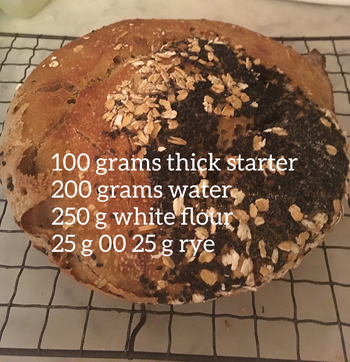 (Needless to say I won't be posting that bin bread) It would've come out perfect if I had let it proof for long enough and added much more flour on the basket! So to do this bake I was determined not to make the same mistakes again, and not to make a mess! So I did a minimum of mixing, stirring it by hand for about 10 minutes, letting it set, and after half an hour I added 1.5 teaspoons of salt, and then put the dough in the refrigerator for the night. The next morning I took it out shaped up the cold dough ! The dough had some surface tension but not a lot it was somewhat slack but not Goopy! this time I placed it in a basket covered with aluminum foil. 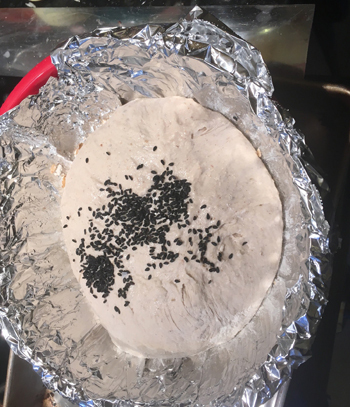 I couldn't find the Rice flour so I used some black sesame seeds and oatmeal for the bottom of the loaf. I was Definitely going to wait till it was doubled in size until before I put it in the oven! That took five hours but I waited! I also was not going to mess with slashing, and I opted for the scissors method. I baked it at 450 farenheit in a covered Dutch oven for 20 minutes and then I turned the heat down to 400 farenheit for a 20 minutes. Great idea to use the seeds to prevent sticking! Good job! It sure came out looking like a NK bread for sure. 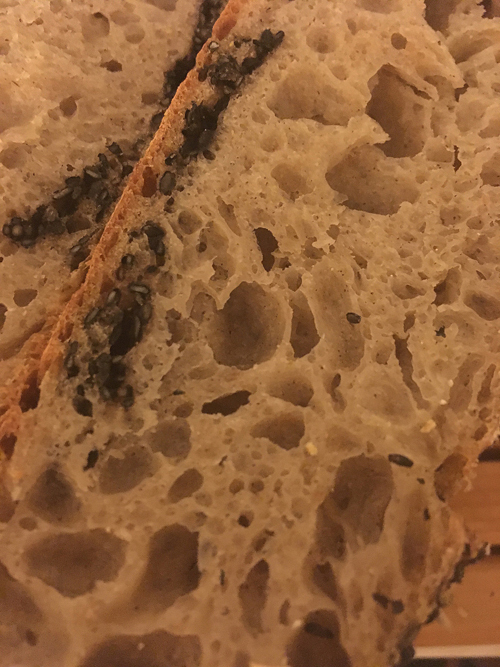 Nice crumb, a bit flat because it was so wet. 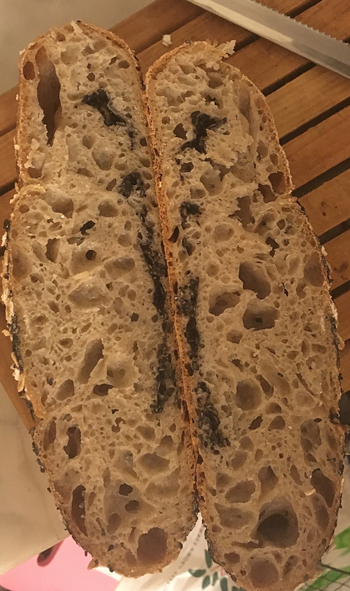 I'm thinking getting the recipe down to 72% from 76% hydration and doing some folds at 1 hour and 2 hours would help the flat shape a lot, cure the sticking and not hurt the crumb one iota - but that is just me. This one was a great success that leads to more in the future. Folding always helps. Well I am working on some more dough now and I have already folded it 2 times so its promising.